Repairing a leaky faucet is a straightforward process, which can prolong the life of this workhorse plumbing fixture. The faucet—whether it’s in the kitchen, bathroom, or behind the bar—acts like a mini dam, holding back a pressurized stream of water until you lift or twist the handle. According to the National Association of Home Builders, it’s safe to expect the average faucet to last about 15 years, but sooner or later, yours will start to leak, either from the nozzle or at the base of the fixture. When that day comes, make the repair immediately, not only to silence the dripping noise, but also to save money and resources. After all, the leaky faucet calculator provided by the U.S. Geological Survey Water Science School reminds us that one drip every minute wastes 34 gallons per year. 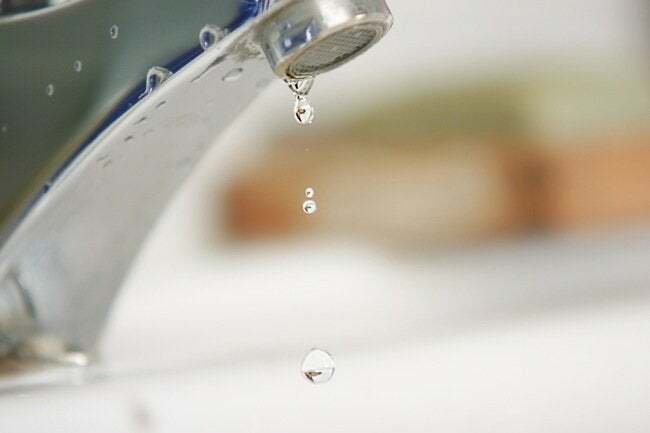 Repairing a leaky faucet is a relatively straightforward process. The first step is to determine what type of faucet you have. There are two basic categories: those with washers and those without. In either case, begin by turning off water to the sink. Usually, the valves are below the sink basin, close to the wall. There should be one for hot and one for cold. Turn both clockwise. Next, open the faucet to release any water left behind in the line, then close the drain. If you don’t have a good drain cover, simply place a kitchen towel over the drain to prevent small parts from falling in. A compression faucet holds back water in the plumbing system with a small rubber washer that tightens in the valve seat (much like a bottle cap screws onto the top of a plastic soda container). To make a repair, pop off the decorative cap that covers the knob. 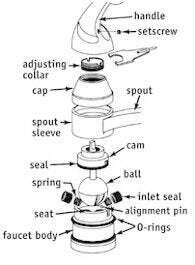 (Or if the faucet has two knobs and both are leaking, apply this process to each one in turn). Proceed by using a flat-head screwdriver to remove the screw at center, then take off the knob and the nut underneath. Remove the stem by rotating it in the “on” direction. If it looks damaged, take the stem to your hardware store and buy a replacement of matching size. Otherwise, clean the part with a wire brush after soaking it in a solution of vinegar and water for about 15 minutes. With any and all new parts at hand, reassemble everything and you should be good to go. Whereas a compression faucet controls the flow of water with a washer, a washerless faucet relies on a disc, ball, or cartridge for the job. Less prone to leaks, this type of faucet usually has one handle rather than dual knobs. Begin the repair by prying off the top cap, removing the screw at center, and lifting off the handle. Next, pull out the workings; as you go, take off any lock nuts, retaining clips, or additional screws. 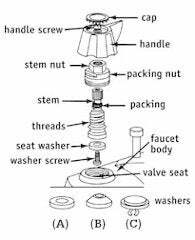 Typically, leaks that occur in disc or ball faucets are caused by worn seals or O-rings. Buy replacements in matching sizes from your local supply store. Use plumber’s grease to roll on the new seals, then reassemble the faucet. If your faucet is the type with a cartridge beneath handle, and if the seals appear to be in good shape, then your problem might be the cartridge itself. Remove it, bring it to the store for comparison purposes, and buy the right replacement. Once you’re back home, simply slide the new cartridge into place and reassemble the faucet. (Just be careful to install the cartridge correctly, or you’ll wind up reversing the hot and cold flows.) Now enjoy the sound of drip-free silence!